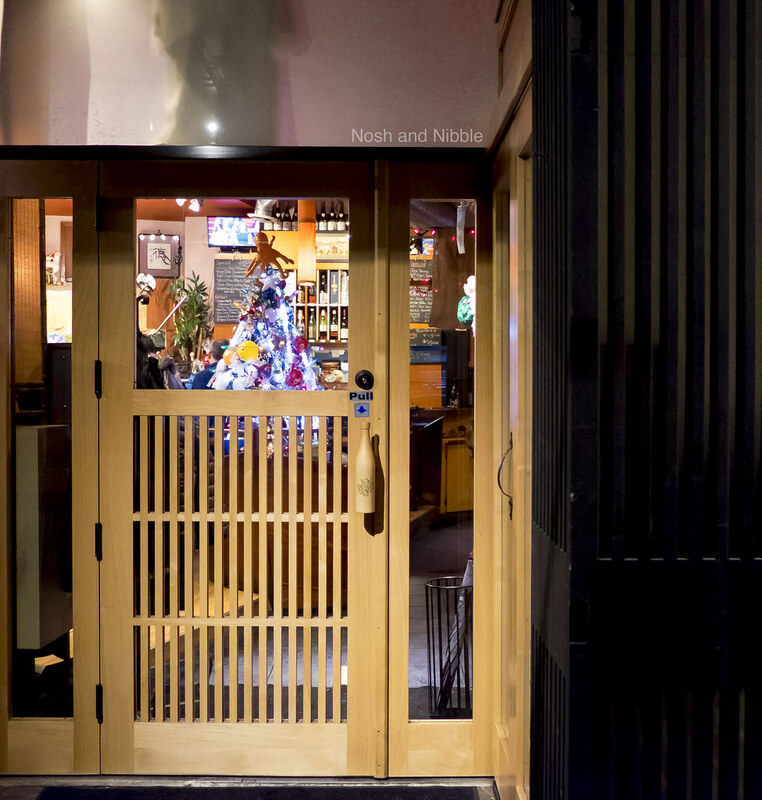 In Vancouver, you have many options for Japanese food. You have your sushi and ramen places and you have izakayas. 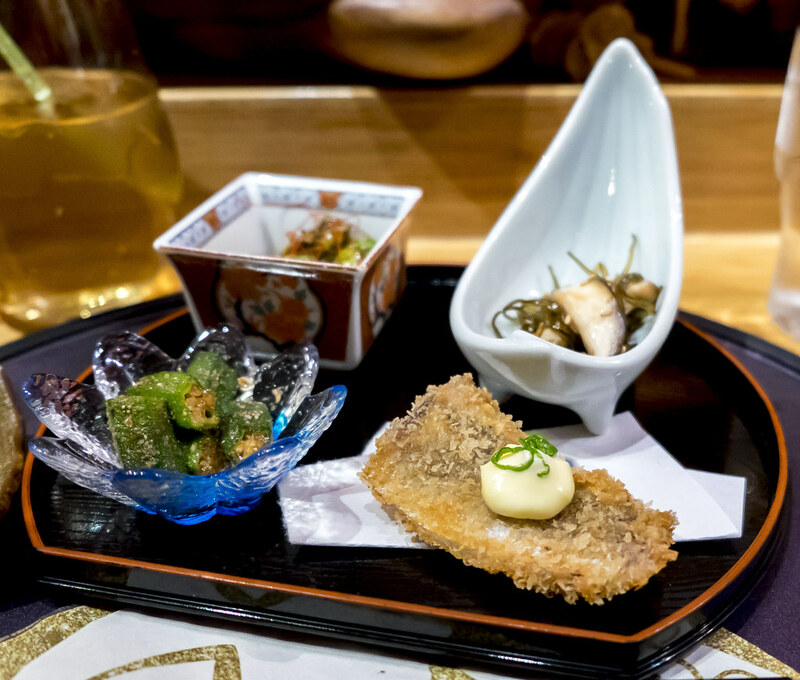 As you dine in the pricier echelons, omakase becomes the definitive standard of fine Japanese dining. 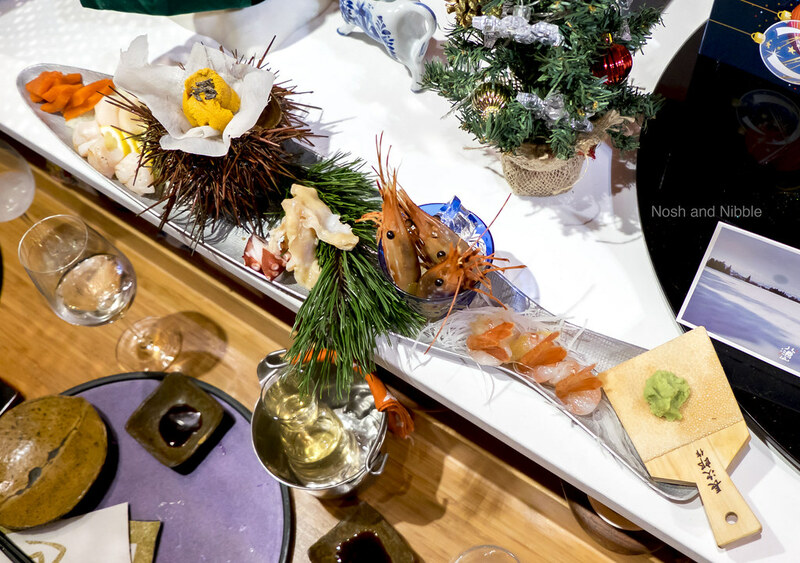 Octopus’ Garden is an example of such a restaurant, offering two levels of omakase. 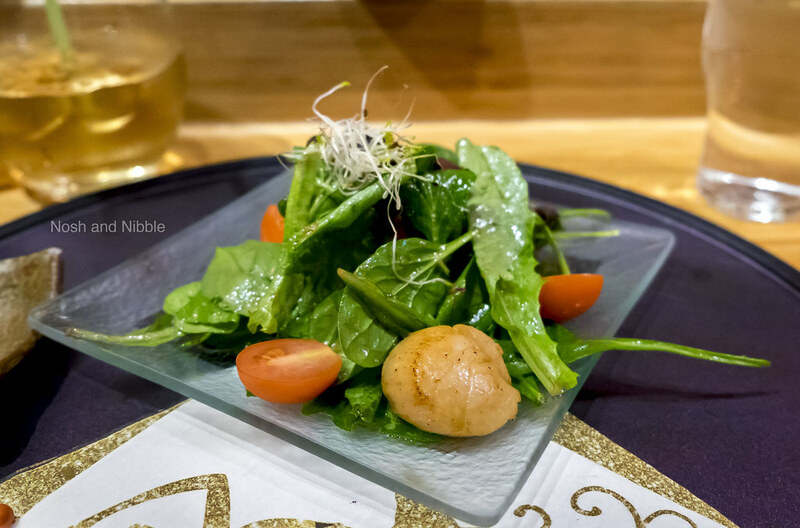 For those new to the scene, omakase is a meal consisting of dishes selected and made by the chef, so there’s no choice given to the diner unless stated in advance. 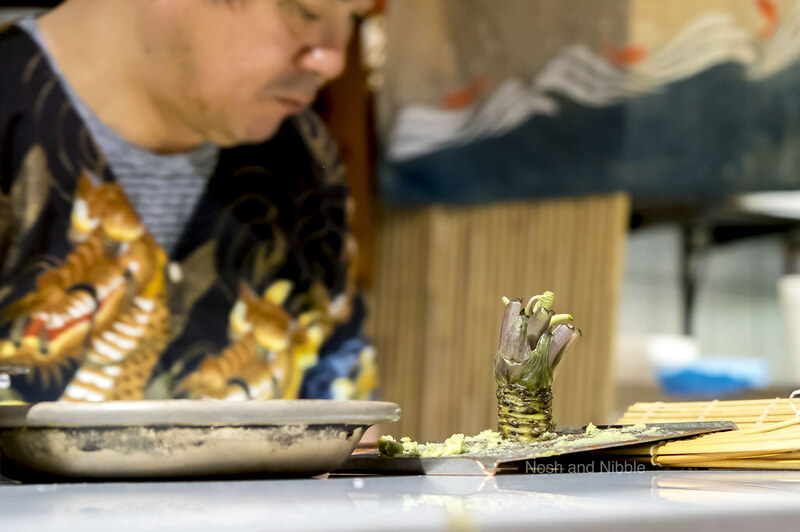 Is the $100 omakase the ultimate Japanese dining experience or should you instead opt for the much cheaper all-you-can-eat restaurants? Read on to find out. 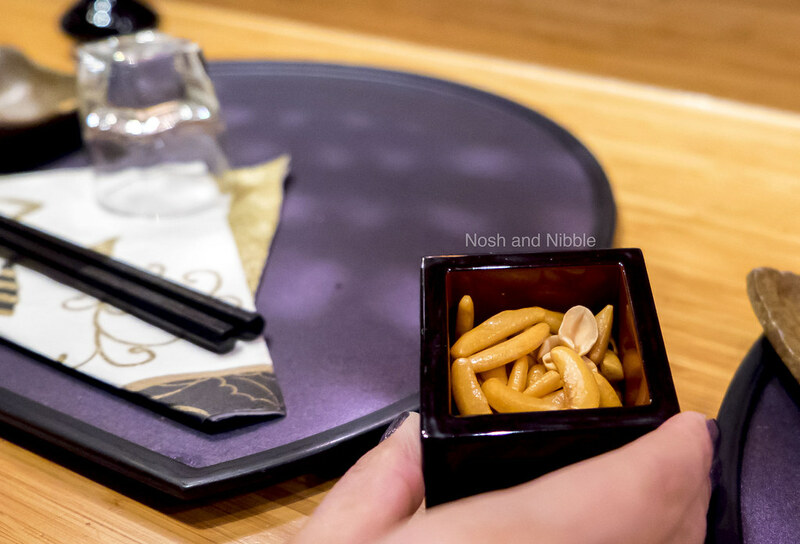 We actually started with some generic rice crackers, but I didn’t consider this to be part of the prescribed 9 courses. Just a small starter to whet thy appetite. The Uni Shooter came in a cute little glass. In one swoop I got a great taste of buttery sea urchin mixed with gooey quail yolk. The Platter came next. The serving dishes (apart from the mackerel) were quite ornate and very cute. If I had to choose a favourite then I'd go with the Okra Salad because it had a good amount of flavour that balanced out the slimy texture. The Scallop Salad came next. There was only one scallop but it was plump and juicy. The dish otherwise looked like any house salad but had enough dressing to fill my mouth with flavour. The Bluefin Tuna Tasting plate was the first raw fish of the night. We live in the Pacific so I’m guessing this was locally sourced Pacific Bluefin Tuna. This species of bluefin tuna may be overfished and as such, has increased in value. It’s up to you whether you want this fish in your next omakase, but do make a request if you prefer a more sustainable fish. 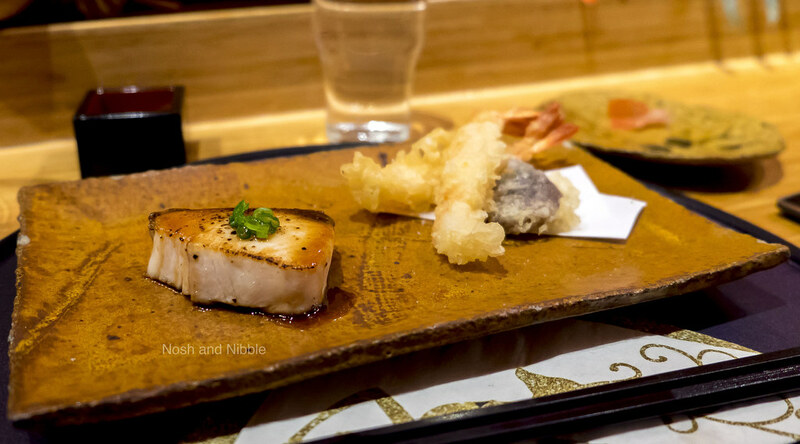 Aburi Belly was the fattiest of the three nigiri but the Aburi Back had the most engaging profile with its deep red flesh. On top of each Bluefin Tuna nigiri was a dollop of wasabi. This was no horseradish-infused wasabi. It was the real deal as evidenced by this wasabi grater. Next up was a Lobster Hamachi and Yuba Soup. 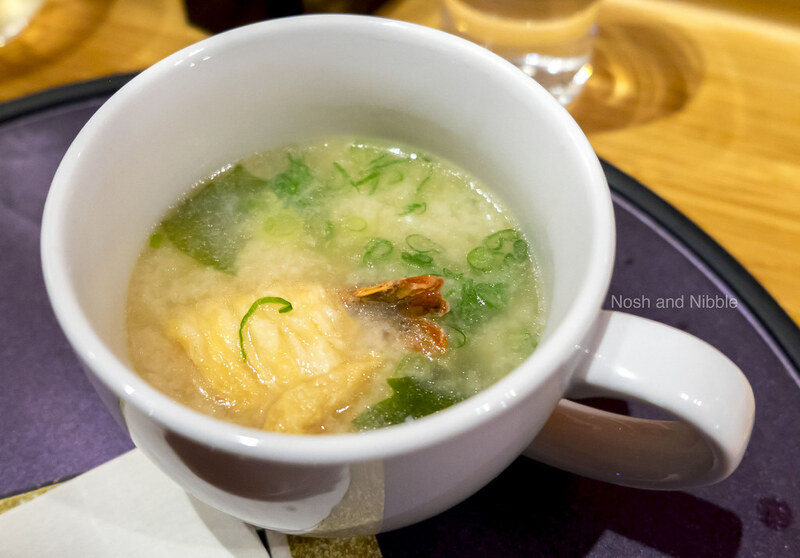 Obviously an upgrade from any miso soup I’ve had, this had a full body broth and was full of lobster taste. The yuba in here looked similar to beancurd but tasted like tofu. It was my first time trying it and I enjoyed the hearty chunk of yuba. The Seafood Tray was the main commodity of the night. This included butterfish sashimi, scallop sashimi, uni, octopus, ebi heads (to be deep fried), and shrimp nigiri. I have a good feeling that a big chunk of your omakase night goes towards this (served for three). 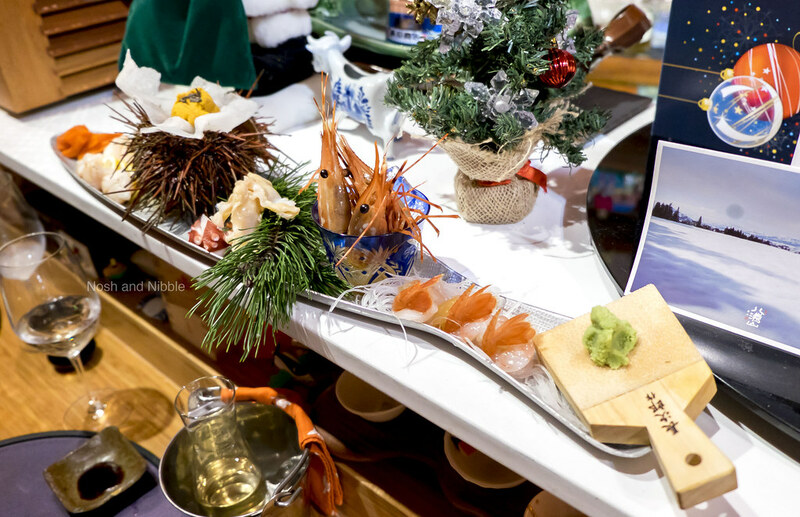 My favourite parts of this tray were the buttery sea urchin (uni) and plump scallop sashimi. 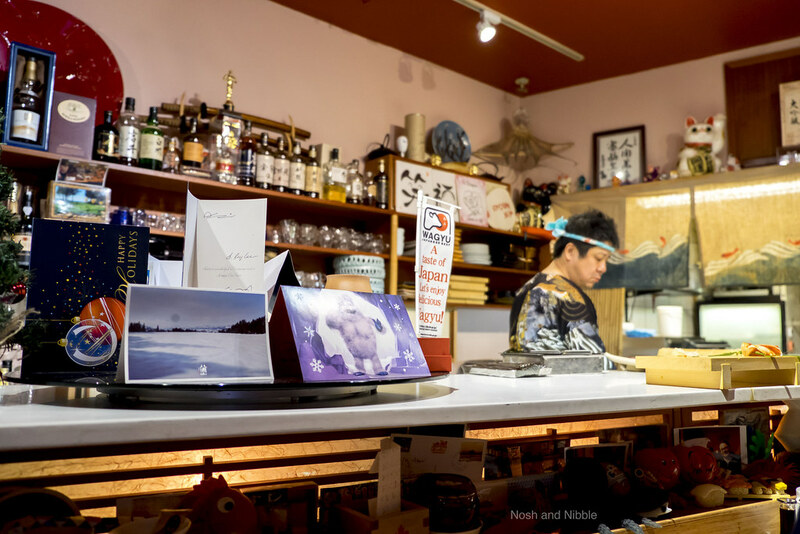 Fun fact: since we came on a statutory holiday, the chef mentioned to us that he went to the fishery himself to purchase his sea urchin for the day. What a champ! Next up was the Yellowtail Teriyaki. This was served with a side of tempura. I’m honestly not a big fan of teriyaki but the sauce here wasn’t half bad and we were treated to a huge portion of well-cooked yellowtail. The tempura had a fresh breading and was very different from your regular tempura found at cheaper restaurants. Then came the Foie Gras Nigiri. 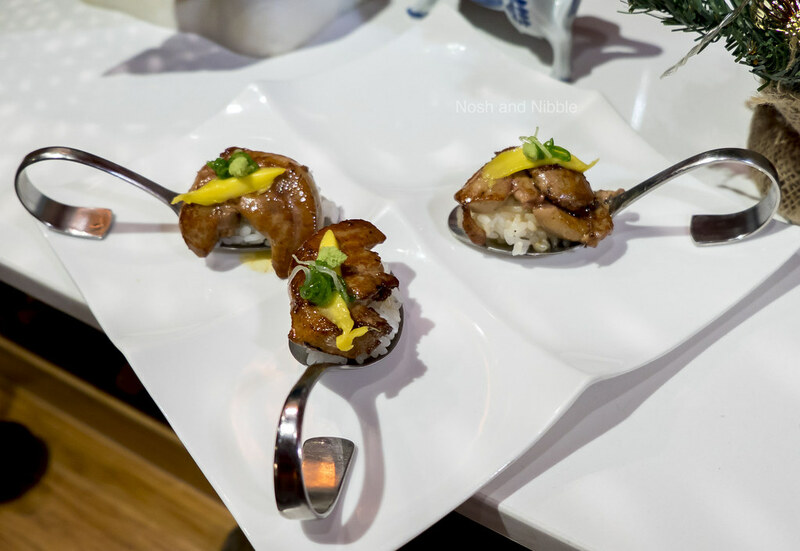 These were plump pieces of foie gras balanced atop dainty canape spoons. This had a buttery taste that I enjoyed, but I feel it may be too buttery for some diners. Really savour that bed of rice if you have an average butter tolerance. And finally, dessert. For the three of us, we split a jumble Banana Tempura. 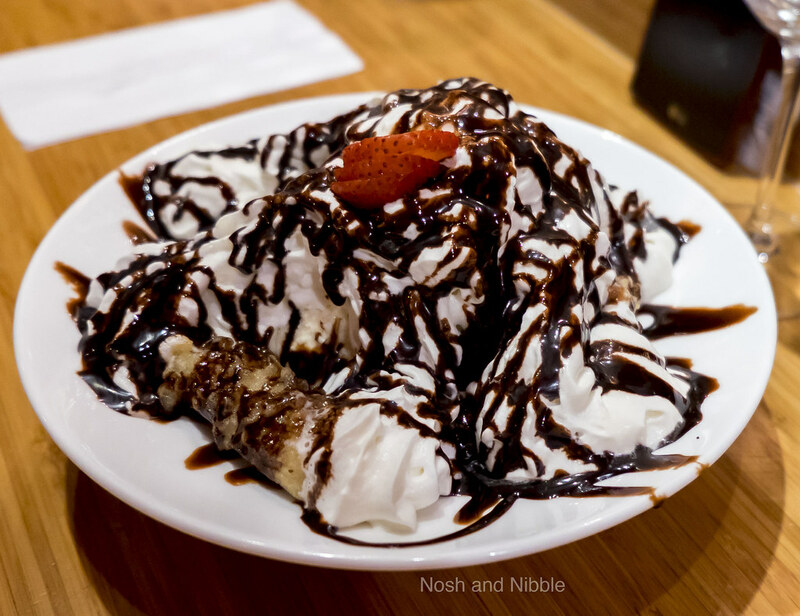 This was a load of fresh cream drizzled with chocolate sauce on top of deep fried banana. This didn’t amaze me much in presentation and the deep fried banana was not a taste that appealed to me. There was also a ton of cream, which was light but still a bit over-the-top. Overall, the omakase menu had some interesting items and I left the restaurant full. The bluefin tuna tasting was pretty phenomenal, the seafood tray had amazing variety, and the mixed appy platter encompassed some cute items normally unavailable a la carte. There were some misses for me though as the scallop salad seemed bareboned and the overdose of cream on the banana tempura did not do any favours for me. On the flip side, the chef was very kind to us at the main counter and was constantly working behind the bar while we dined. 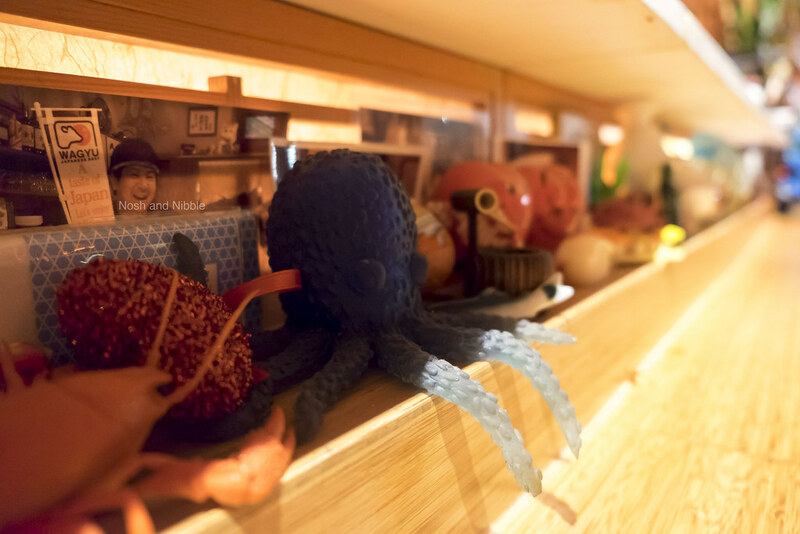 Octopus’ Garden is an unassuming restaurant from the outside, but once you get in it has a cozy interior with many references to octopi and Japanese culture. 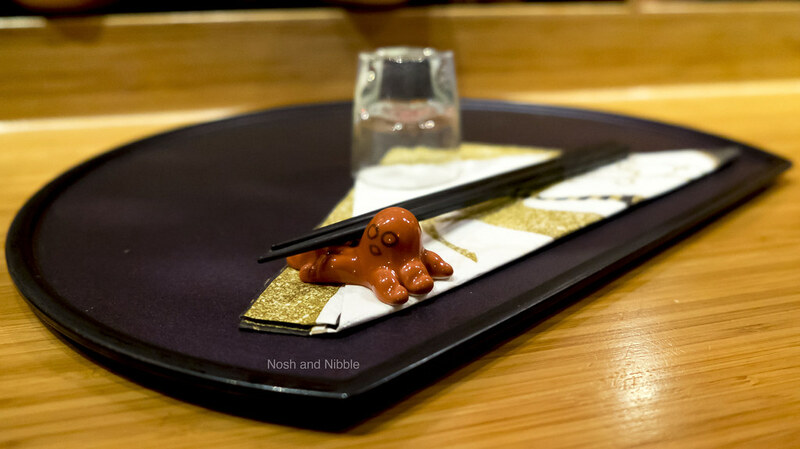 The knick knacks found under the sushi bar made the place feel especially homey. For those looking for an extra kick of Japanese culture, the bathroom features a Japanese toilet complete with a bidet! The restaurant was decorated for Christmas and this cute tree was found beside an equally cute boat-shaped booth (fits 2). 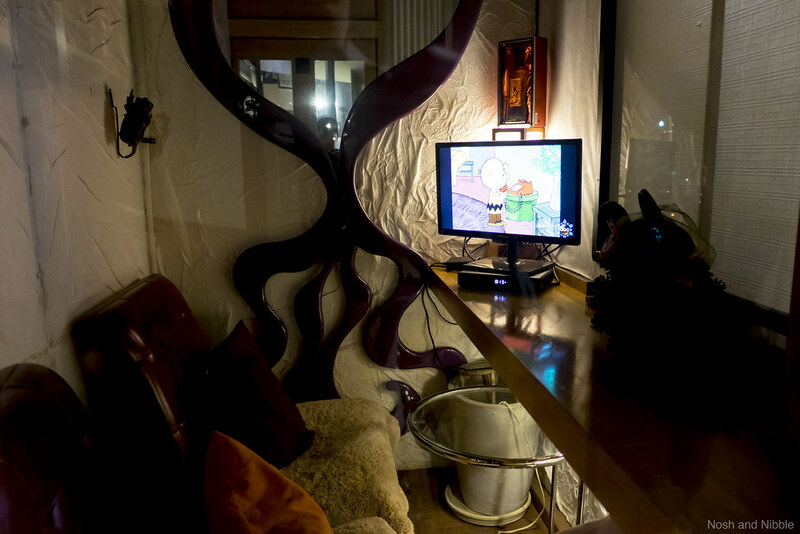 There was a television with cable playing near the front, so I was curious as to who uses it. The place is otherwise very small with seating for about 30 guests, and 8 at the bar. 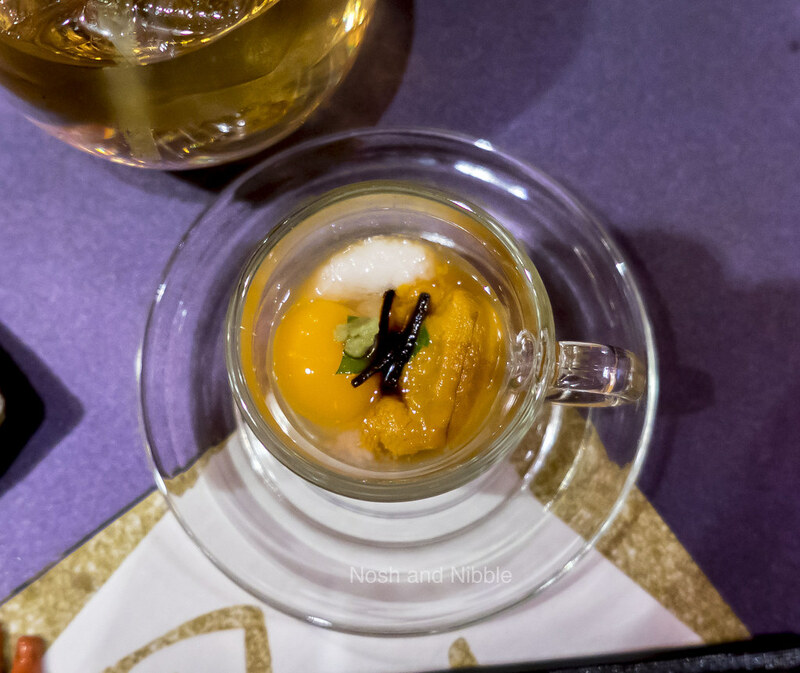 During this omakase experience, I felt like I was treated as a king. Our server cleared our plates with grace and we were given explicit introductions to every plate that arrived. Water top-ups happened frequently. The only problem I experienced was how long the omakase experience takes. There were some gaps approaching 20 minutes between some plates and our initial arrival of 5:45pm finished at nearly 9pm. Plan your night accordingly. Definitely make a reservation as this place fills up and I watched an angry couple be shown the door as they did not have a reservation.